A 50 Hz electrical substation in Melbourne, Australia. This is showing three of the five 220 kV/66 kV transformers, each with a capacity of 150 MVA. This substation is constructed using steel lattice structures to support strain bus wires and apparatus. 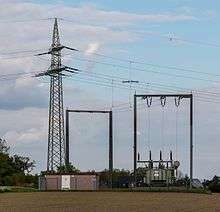 Former high-voltage substation in Stuttgart, Germany, now 110kV switching station. The 220kV level is eliminated for grid simplification. Electrified railways also use substations, often distribution substations. 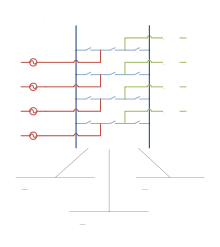 In some cases a conversion of the current type takes place, commonly with rectifiers for direct current (DC) trains, or rotary converters for trains using alternating current (AC) at frequencies other than that of the public grid. Sometimes they are also transmission substations or collector substations if the railway network also operates its own grid and generators. The Adélard-Godbout substation in Old Montreal is Canada's oldest substation, in continuous operation since 1901. It has a facade in clay brick with grey stone ornaments, to blend in to its downtown environment. With Overhead Transmission Lines (OHTLs), the propagation of lightning and switching surges can cause insulation failures into substation equipment. Line entrance surge arrestors are used to protect substation equipment accordingly. Insulation Coordination studies are carried out extensively to ensure equipment failure (and associated outages) is minimal. ↑ "Joint Consultation Paper: Western Metropolitan Melbourne Transmission Connection and Subtransmission Capacity" (PDF). Jemena. Powercor Australia, Jemena, Australian Energy Market Operator. Retrieved 4 February 2016. 1 2 3 Stockton, Blaine. "Design Guide for Rural Substations" (PDF). 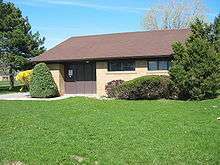 USDA Rural Development. United States Department of Agriculture. Retrieved 4 February 2016. ↑ Steinberg, Neil. "Lights On but Nobody Home: Behind the Fake Buildings that Power Chicago". Retrieved 14 December 2013. ↑ "Transformer Fire Video". metacafe. User Eagle Eye. Retrieved 4 February 2016. ↑ John, Alvin. "EE35T - Substation Design and Layout". The University Of The West Indies at St. Augustine, Trinidad And Tobago. Retrieved 4 February 2016. ↑ Baker, Joseph W,. "Eliminating Hurricane Induced Storm Surge Damage To Electric Utilities Via In-place Elevation Of Substation Structures And Equipment" (PDF). DIS-TRAN Packaged Substations. Crest Industries. Retrieved 4 February 2016.